Five months ago I did something crazy: I moved out of my apartment into a new-to-me 34 foot-long motorhome I christened Katie Kowhugger and started driving east. It is crazy not because I am doing it, but because it took me so long to finally give myself permission to make it happen. I have wanted to create photographic portraits of individuals living at farmed animal sanctuaries for several years. I was doing so in a small way at the sanctuary where I worked and the northerly location, but I longed to indulge wanderlust and visit the many sanctuaries spread across the US and Canada. It was an enormous endeavor in my head; I had only visited three other states and never left the country – travel was an unknown quantity in my life. I had a Google map of approximate sanctuary locations I had been building by finding sanctuaries on lists or on Facebook, and it was steadily climbing toward the hundred mark for just farmed animal sanctuaries. I was daunted by the thought of doing it. So I let it simmer, let myself hope and dream and discuss, but never take the strides to really do much about it. One of my earliest, and personally poignant, portraits of Oreo calf to whom we had to say goodbye due to irreparable health issues a month after this photo was taken. Fast forward past some challenging times, some joyous times, and many in between, I found myself unhitched from the stabilizing and comfort-making force of employment. I recall looking forward and back, fearful of what was to come, relieved and stressed by what had come before, and then taking a moment just to be present with the possibility of finally following this idea of becoming a traveling photographer. It was magical. It was also terrifying, so drastically outside my comfort zone that my stomach rebelled on more than one occasion, and fraught with so many unknowns. And it was exciting. I dove into research on living a mobile lifestyle, started the quest for a mode of conveying me cross-country, looked at maps, updated my sanctuary list, purged clutter and hundreds of books I previously thought would need to be ripped from my lifeless fingers, and, most importantly, told everyone I was doing it. That was a truly scary task, because then they got excited for me, and a sense of being held responsible for this crazy idea hit me. What was I thinking?? My evolving map of sanctuaries. By this time I had a few more sanctuaries with whom I had connected and photographed. A good portion of the California sanctuaries, one in Salt Lake City, and all the Oregon sanctuaries had created a sizable collection of portraits of the amazing individuals who live in these places. This helped the idea of visiting all the sanctuaries seem slightly less challenging. I only had seventy-five or so more to go. During this process I tried to let every conceivable roadblock dissuade me. I could not find a suitable, yet affordable RV, guess that cuts it. How was I going to earn money? Better stay put and get a job. I was not equipped with a deep savings to finance such an expedition – best to build that up prior. I’m going to leave my family and what if something happens? Staying close by feels safer. I’m not a traveler. I don’t’ know what I’m doing. I’m afraid of snow (true statement, I don’t know how you non-Southern Californians handle that frozen water falling from the sky). I was thinking so long and hard about how I could fail that I often forgot to think about how I could succeed. Luckily for my crazed brain and the future of the expedition I have some rather rational friends who gave me verbal, emotional, and, in one jarring case, physical slaps upside the head and reminders that this is what I had been DREAMING about doing. And I was, in small steps and starts, making it happen. The RV showed up. A friend walked me through the intricacies of driving and maintaining a motorhome. Some house sitting gigs appeared to help build up the resources. A beautifully generous friend for whom Katie Kowhugger RV is named made a contribution to getting me going. Friends helped me prep and clean and pack the RV for travel. It was the height of summer so I could stave off having to confront snow for a while. And then I actually sat behind the wheel and drove off. I’ll save the story of the actual cross-country trek for another post; let it just be known that Katie Kowhugger earned the nickname “The Behemoth Diva” during that crossing. As I reflect on the last few months of this still-in-progress journey - the challenges, breath-taking beauty, occasional loneliness, joyous connections and new friends, tangential paths, small towns and large cities explored, the ever-increasing awareness of the California bubble within which I live - I find it needful to be reminded that at the heart of it was a leap of faith I took in myself: in my ability to learn and grow and pursue this dream, in the validity of my voice and my lens at work for the farmed animals residing at sanctuaries acting as ambassadors for those who are trapped in the processes of animal agriculture. 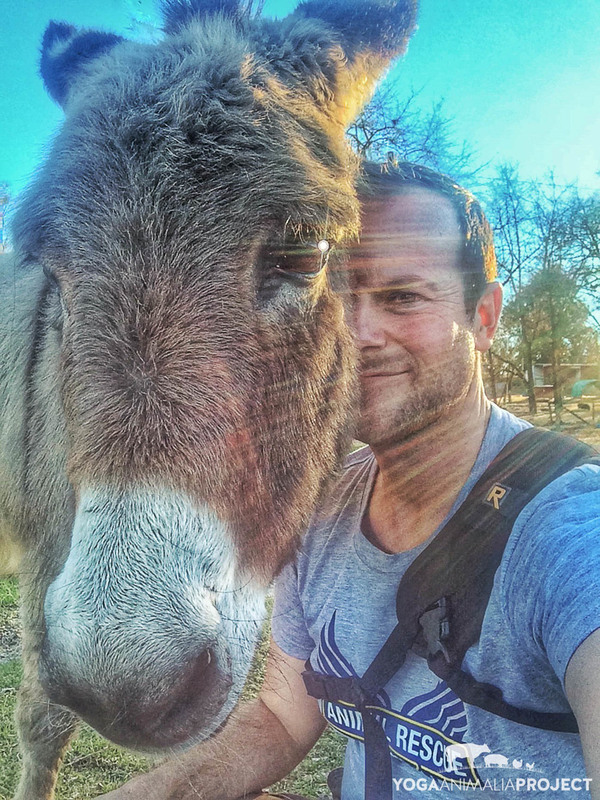 As I reflect I think of Willow, a rescued mini donkey living at Cotton Branch Animal Sanctuary in Leesville, South Carolina with whom I bonded fiercely, and I remind myself that she is why I am on this quest. I have the privilege of being connected to these individuals in my own way, and the joyous responsibility to share their stories and portraits because each one is an individual worthy of being known, and I want others to know them as well. So this journey is not crazy, it is my dream, and I give myself permission to pursue it. Now excuse me while Katie Kowhugger and I continue heading south before the snow finds us.